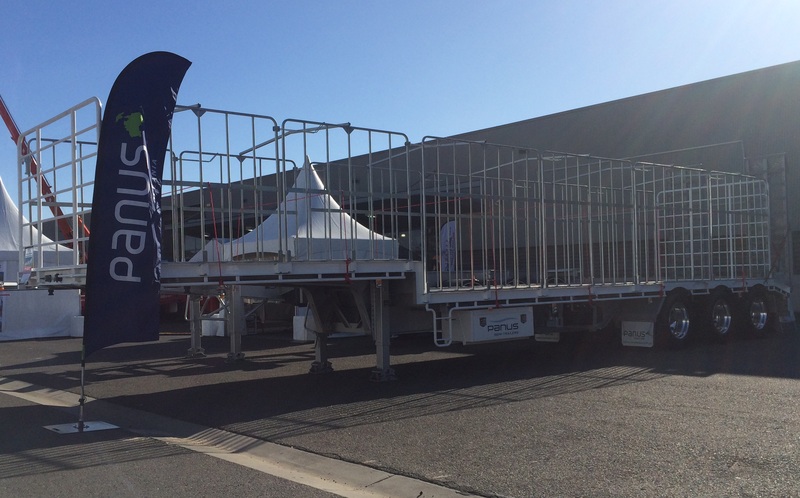 Panus Semi-Trailers has used the three days at the International Truck, Trailer and Equipment Show in Melbourne to generate further brand awareness and lay the foundation for further product releases in 2016. Despite crowd numbers being somewhat down on previous shows, the engagement and response from existing and new customers that were attracted to the Panus exhibit to find out more information, confirmed that the young Company is on the right path for sustained success. In fact, much to the delight of Sales/Marketing Manager Jozef Horvat, the team even managed to take orders for semi-trailers from NSW and Victoria up until the last hour of the last day at the show, one being a client who initiated his enquiry that same day and required additional container skel trailers for his fleet! The approach to market in the two years since its introduction into Australia with just the Flat Top and 40ft Skel models, Panus Semi-Trailers has worked meticulously with local customers in developing and evolving their product range which now incorporates Drop Decks, Retractable Skels, Lead and Low Tare Skel models, with further releases expected over the coming months. “We haven’t cut any corners in developing each trailer model and making sure they meet the applications of our customer segments. In fact, our clients have been a key ingredient in helping us develop our specification through ongoing prototype trials, driver/operator feedback and our proven Product Improvement Process which is critical to our model development,” explained Jozef. The market response to date has been very favourable for Thailand’s leading trailer OEM, and with a number of customer and dealer visits to the factory completed, coupled with successful customised projects that have taken place around the country already, both Rod Cunningham (Panus Semi-Trailers CEO) and Jozef are confident that the coming months will see Panus really establish its presence within the local market. “We have developed strong ties with many of the country’s operators such as Sidelink Transport, Wemyss Transport, TH Transport and Powercor and they have all indicated that they’ve been more than suitably impressed with our trailers and importantly, our dealers are providing exceptional support when required,” Jozef said. Post-show, Panus Semi-Trailers is embarking on a project to ensure their footprint across Australia continues to grow and will announce new product releases in the coming weeks.